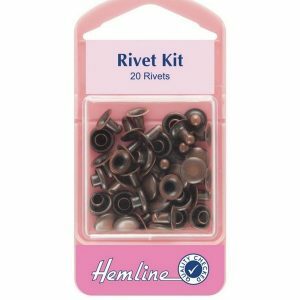 Rivet Kit: Bronze – 7mm. Easily fitted as reinforcements to jeans pockets, sportswear and accessories. No tool required. 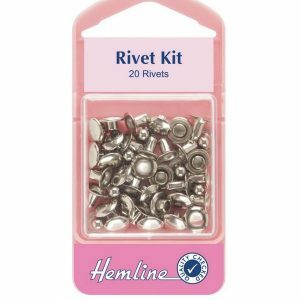 Rivet Kit: Nickel – 7mm. Easily fitted as reinforcements to jeans pockets, sportswear and accessories. No tool required. 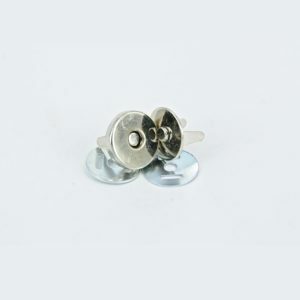 Pack of 10 magnetic studs for your bag making. To install, 1. Mark a dot on the spot of the required installation. 2. 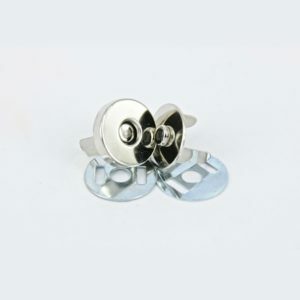 Take the washer from the magnetic snap and place in the centre of the dot. 3. Make two marks in the slits on the side of the washer. This is where the holes will need to be cut. 4. Make 2 buttonholes around these lines and slit the holes open with a seam ripper. 5. Place the prings through the holes. Place the washer over the prongs. 6. Bend the prongs towards the middle of the magnet using something firm. 7. Repeat with opposide side of magnetic snap.